As one of South Jersey's top builders, Skip Holtzapfel Builders, Inc. has constructed hundreds of new homes and commercial properties throughout Cape May County over the past 32 years. The company also does renovations ranging from minor deck repairs to major additions and alterations. Whether it is a quaint seashore cottage, or an oceanfront mansion, we take pride in every home we build, from the foundation to the roof shingles. Quality and satisfaction are our number one priorities. Let us build the home of your dreams! With over 32 years of experience, you can expect nothing less than perfection from Skip Holtzapfel Builders, Inc.
Whatever it is that you want to build, we can create just the look and feel that you desire your home or office to be. More than 90 percent of our clients are referrals, proving that our reputation is second to none. Trust your dream home to the best. Members of the Cape May County Chamber of Commerce, the Greater Wildwood Chamber of Commerce, Borough of Stone Harbor Chamber of Commerce and the Better Business Bureau. We are a fully licensed and insured builder serving all of Cape May County. 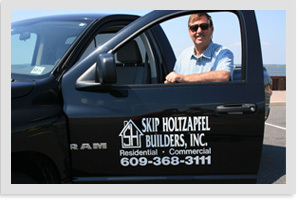 Skip Holtzapfel Builders, Inc. is family owned and operated. Skip and his staff can walk you through any venture...from architect to handing you the keys at the completion of your project. Please Click Here to contact Skip Holtzapfel Builders, Inc. about your project. Skip did a wonderful job. He is a man of integrity who obviously cares about his work. Great attention to detail. I highly recommend him to anyone looking for quality workmanship.